Every dog has his day, but Easter belongs to the bunnies! 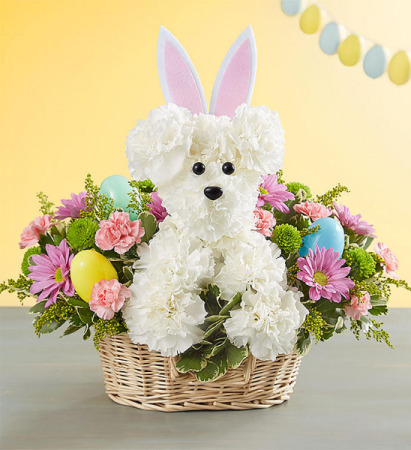 We’ve dressed up our truly original a-DOG-able® arrangement for Easter, adding pastel carnations, asters, and poms. With a pair of festive bunny ears and accented with colorful eggs, this playful pet creation is sure to make it a hoppy holiday celebration! 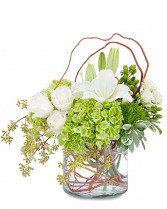 A naturally styled combination of lilies, roses and hydrangea in a clear vase accented with curly willow to make this simply styled design. This bestselling tribute to the European flower market style is all decked out for Spring to bring the beauty of the season to any occasion! 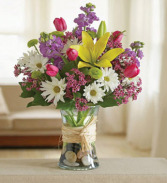 Tulips, lilies, stock, daisy poms, button poms, waxflower and salal, beautifully designed by our expert florists. Clear glass gathering vase filled with stylish river rocks and tied with raffia. Does someone you love dream in French? Do they hum "Springtime in Paris" in the shower? Then this romantic gift is sure to make their fancies take flight. 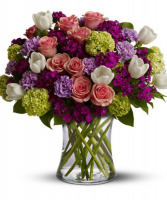 Roses, tulips, florigene carnations , hydrangeas and more - in the prettiest hues of pink, purple, white and green - create a beautiful all-around bouquet.